A drawing of a town at the centre of a vortex, with rocks about to fall and crush it. There are waves and water-spouts encircling it. Above are dark clouds with great curves of water descending from them. 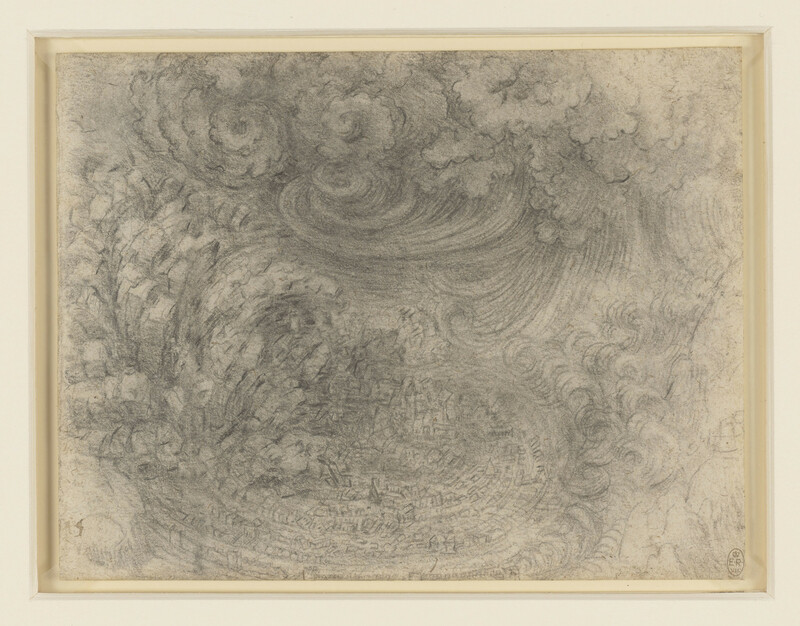 A series of eleven drawings by Leonardo of a mighty deluge are among the most enigmatic and visionary works of the Renaissance. Modest in size and densely worked, each shows a landscape overwhelmed by a vast tempest. Here the storm breaks over a city, destroying a mountain and sending great blocks of stone cascading down onto the buildings. The drawings were probably made for his own satisfaction rather than as studies for any project.